Bulk solids, which vary widely in their density, form and features, confront the measuring instruments in industrial production processes with widely different challenges: powders often generate huge clouds of dust, while coarse, heavy bulk solids cause tremors and noise when being filled into a container from a great height. 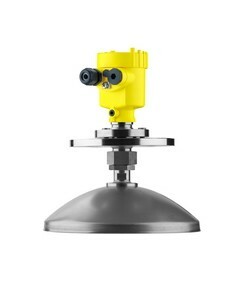 With VEGAPULS 68, level measurement in bulk solids is largely independent of process conditions. Due to optimized VEGA radar technology, the sensor can evaluate signals 1,000 times smaller than those conventional radar instruments can pick up. This high sensitivity allows a measuring range of up to 75 m even in products with bad reflective properties.